According to The Joint Commission, communication failures are the cause of 60 percent of reported serious or fatal mistakes every year. Scott Lind, MD, chair of surgery at UF Health Jacksonville, and a team of dedicated residents are working to change this. The group is spearheading an innovative virtual reality training system to educate medical students about effective communication in the OR. This is where virtual reality, or VR, comes in. Before a surgeon comes into the OR, they need to learn how to do the procedure in a simulated environment. These types of simulations offer the best training for novice learners, such as new nurses, surgical techs, medical students, and anesthesia and surgery residents. Whitney Goering, MD, is the research assistant who constructed the virtual humans. 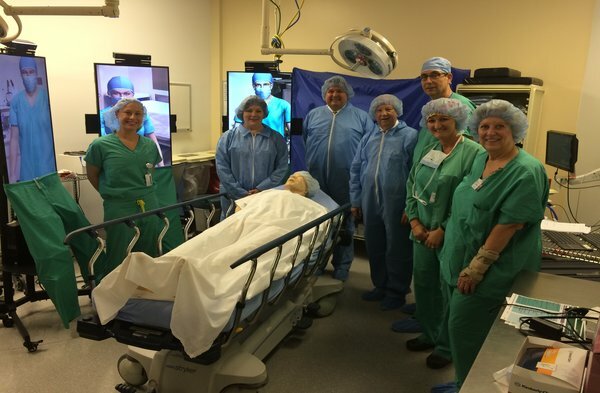 She conducted a study with 11 participants — four surgeons, three nurses, two medical students and two anesthesiologists — who completed a surgical safety checklist scenario in the OR with their virtual team. For more information about Surgery, visit UFHealthJax.org/surgery. 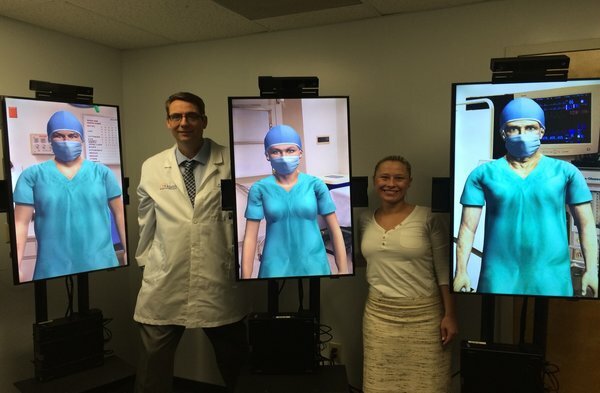 Scott Lind, MD, and Whitney Goering, MD, alongside the three virtual humans used to train residents on operating room protocol. Lind and Goering demonstrate a surgical timeout with the virtual humans for UF Health Jacksonville leaders.